The Youngstown State volleyball team will welcome three teams to Beeghly Center this weekend as it hosts the YSU Invitational. The Penguins will play Friday matches at 11 a.m. against Saint Francis U (Pa.) and at 7 p.m. against Tulane, and YSU will take on Toledo in the final match of the invitational on Saturday at 1 p.m. Also on the slate are Friday matches Tulane versus Toledo at 1 p.m. and Toledo versus Saint Francis at 5 p.m. Saint Francis and Tulane will also play Saturday at 11 a.m. Live stats for all six matches will be available on YSUsports.com, and live video for each of YSU's matches will be streamed on the Horizon League Network. The Penguins went 2-1 in three matches at the Coastal Carolina Invitational with each match being decided in five sets. YSU beat the host Chanticleers in the first match of the tournament 25-20, 23-25, 20-25, 25-21, 16-14 behind 15 kills apiece from Alexis Egler and Aly Ryan and nine blocks from Jenna Cavanaugh. The Penguins led Iowa 2-1 before dropping the final two sets in a 20-25, 25-16, 23-25, 25-18, 15-11 setback. Missy Hundelt had a career-high 30 digs in that match while adding 18 kills. Less than an hour later, YSU dug itself a 2-0 hole against Wofford before rallying for a 15-25, 18-25, 25-21, 25-16, 15-13 victory. Egler led the team with 16 kills while hitting an efficient .378, and Nichele Johnson had seven blocks. Missy Hundelt needs 39 kills to become the 11th Penguin in school history to reach 1,000. The Penguins last hosted a non-conference tournament in 2010. YSU was 1-2 that weekend, opening with a 3-1 win over Howard and dropping matches to Niagara and Central Michigan. 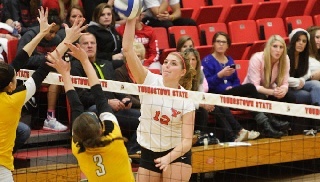 Missy Hundelt was YSU's representative on the all-tournament team. YSU went 2-1 at the Coastal Carolina Invitational last weekend and had a 2-1 lead on Iowa before losing. Had the Penguins held on, it would have given them their first win over a Big Ten team in school history. The two wins already represent the season total that the Penguins had in 2010, the freshman year for YSU's senior class. The Penguins are 2-1 for the first time since starting 5-0 in 2007. Before coming back from a 2-0 deficit against Wofford on Saturday, the Penguins hadn't won a match in which they dropped the first two sets since Sept. 16, 2005. Conversely, they'd lost six matches in that time frame when they led 2-0. Missy Hundelt's 30 digs against Iowa were not only the most of her career, they were the most by a Penguin since Karla Everhart had 34 on Sept. 29, 2007, at Green Bay. Hundelt is only the third YSU player to post 30 digs in a match since rally scoring started in 2001. Hundelt's previous high for digs was 21 against UNC Wilmington on Sept. 15, 2012. Alexis Egler surpassed 500 career digs last weekend against Iowa. She currently has 511 in her career. Chelsea Guerrieri surpassed 100 career digs against Iowa. Erika West reached 750 career digs in the Iowa match. Hundelt's five service aces tied for the eighth-most for a single match since rally scoring began in 2001. Missy Hundelt needs 39 kills to reach 1,000 for her career. Jenna Cavanaugh needs five kills to reach 300 for her career. More impressively, she's just 15 blocks from 250. Currently, only 11 players in school history have reached 250 in their careers. Alexis Egler is 13 kills away from 500. Aly Ryan needs seven blocks to reach 100 for her career. She's played in just 32 matches and is averaging 0.87 blocks per set over her career. Youngstown State senior outside hitter Missy Hundelt has 961 kills in her career, needing just 39 to become the 11th Penguin in school history to reach 1,000. Hundelt would become the first Penguin to surpass 1,000 since Ruth Boscaljon in 2008. Hundelt currently ranks 12th in school history in career kills, trailing Ebony Barbosa's total of 985 by 24. The senior also ranks sixth in school history with an average of 3.12 kills per set. Hundelt also has 794 digs in her career. Only four players in school history have surpassed 1,000 kills and 1,000 digs. Saint Francis went 0-4 last weekend at the Virginia Tech Hokie Invitational, losing in straight sets to Michigan State, Pacific, Virginia Tech and Towson. The Red Flash were held to a combined hitting percentage of negative .019 and allowed 2.3 aces per set. Sophomore outside hitter Hannah Kutny averaged a team-high 2.27 kills per set, and freshman middle blocker Sophie Murdock averaged 0.67 blocks. The Red Flash were picked to finish in a tie for fifth in the Northeast Conference preseason poll. Last season Saint Francis U ranked third in the country with 1.82 aces per set and finished with a 14-16 record. The Penguins are 28-3 all-time against the Red Flash, but Saint Francis U has won two of the last four contests dating back to 2005. Tulane went 3-0 at its own tournament – the Kathy Trosclair Memorial - last weekend and added a four-set victory at Southeastern Louisiana on Tuesday for a 4-0 start. The Green Wave has won four straight matches for the first time since 2009 and is 4-0 for the first time since 2007. Tulane has eight newcomers on its team, and they've been big contributors. Freshman outside hitter Annie Shurtz is averaging 3.67 kills per set on a .366 clip, and fellow freshman Sarah Strasner has 25 kills while hitting a very impressive .605. Tulane has a team attack percentage of .280 and is averaging nearly five kills more per set than its opponents. The Green Wave was 6-21 last season and was picked to finish 10th in the Conference USA preseason poll. YSU has never played Tulane in volleyball. Toledo split its four matches last weekend at its Blue/Gold Invitational, beating Loyola and Eastern Illinois and falling to Marist and West Virginia. Senior outside hitter Lauren Rafdal is averaging 3.94 kills on a .279 attack percentage, and senior middle blocker Dakota Harkins is averaging 1.07 blocks per set. The Rockets were 8-21 last season and were picked to finish sixth in the MAC West division. The Penguins are 3-16 all-time against Toledo with the last win coming in the last meeting between the teams in 2008. Youngstown State is coming off its best season in 13 years, and the Penguins' seven seniors are looking to raise the bar with almost everyone returning from last season. More than 96 percent of the team's kills and blocks return from last season, and 91 percent of the digs return. There are four players who are gone from last year - a middle blocker who played in 21 sets, a defensive specialist who appeared in four sets, a backup setter who played in five sets and a setter who played in 97 sets as part of the 6-2 offense. Among Horizon League teams, YSU returns the highest percentage of kills, blocks and digs from last year's squad. The Penguins return the second-lowest percentage of assists. Youngstown State has a Horizon League-leading seven seniors on its roster for the 2013 season. Valparaiso has five seniors and two redshirt juniors, and Green Bay has five seniors. Cleveland State has three seniors on its roster, and Oakland, UIC and Wright State have two apiece. Milwaukee has just one senior on its roster. Bowling Green is the only other Division I team in Ohio to have seven seniors. No other school in the Buckeye state has more than five seniors. Youngstown State will be trying to put together an impressive non-conference record for the second year in a row. Youngstown State was 10-4 and won eight straight matches at one point during non-conference play last season. The 10 non-conference wins last season were the most since 1999, and the Penguins used that to springboard into a 15-14 mark for the season, which was their best record in 13 years. Youngstown State was among the most-improved teams in the country last season, its first under head coach Mark Hardaway. The Penguins' 10-win improvement - going from five to 15 - tied for the 10th-best mark in the country. Further, their 99-spot improvement in the RPI was 15th-best in the country. Youngstown State seniors Jenna Cavanaugh and Missy Hundelt both earned preseason honors by the Horizon League Coaches in their preseason poll. Cavanaugh was voted the league's preseason defensive player of the year after leading the conference in blocks in 2012. Hundelt was picked to repeat as a member of the all-league team. Even with the significant amount of experience returning for the Penguins in 2013, Youngstown State was picked to finish seventh by the Horizon League coaches in their preseason poll. YSU finished sixth last season with a 5-9 mark in conference play and earned the final spot in the conference tournament. YSU received 20 points in the poll, just five behind league newcomer Oakland. Head coach Mark Hardaway would prefer to run a 6-2 offense with the Penguins' roster composition, but YSU will have to go with Casey D'Ambrose as the lone setter for at least a couple weeks. Jessie Gerig is the only other setter on the roster, and she was out the entire preseason and the first week with a wrist injury. The Penguins employed two setters in their offense at some point in 28 of their 29 matches last season. The only exception was the season opener. The Youngstown State volleyball team will play Arizona State at the University of Illinois on Thursday before playing three matches at the Saint Louis Billiken Classic next weekend. It will be a homecoming for Penguins senior Missy Hundelt, who is a native of St. Louis suburb St. Charles.